With the Quick Product Create Tool, you can use a single design to create up to a hundred products all at once. 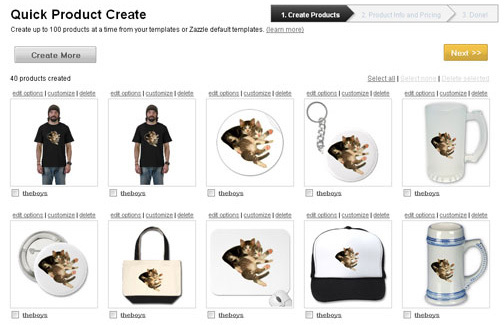 Just follow the simple 3-step wizard, and you'll be able to easily place your design on a range a different products. This tool will not only increase your productivity, but it is also a fast way to fill your store with lots of great designs. Although Quick Product Create places your images on many products at once, you still have full control when it comes to editing the arrangement of your design, if you don't like how it looks on a given product. You can find the Quick Product Create tool in the Products tab of your store, or you can go there directly. You will be prompted to log in to your account, if you are not already signed in.